Sun., Feb. 3, 2019, 3:03 p.m.
ABU DHABI, United Arab Emirates – Pope Francis landed Sunday in Abu Dhabi on the first-ever papal trip to the Arabian Peninsula, where he is seeking to turn a page in Christian-Muslim relations while also ministering to a unique, thriving Catholic community. He made the appeal at the Vatican before boarding a plane to the United Arab Emirates, which has been Saudi Arabia’s main ally in its war in Yemen – a way to avoid embarrassing his hosts with a public call while in the region. 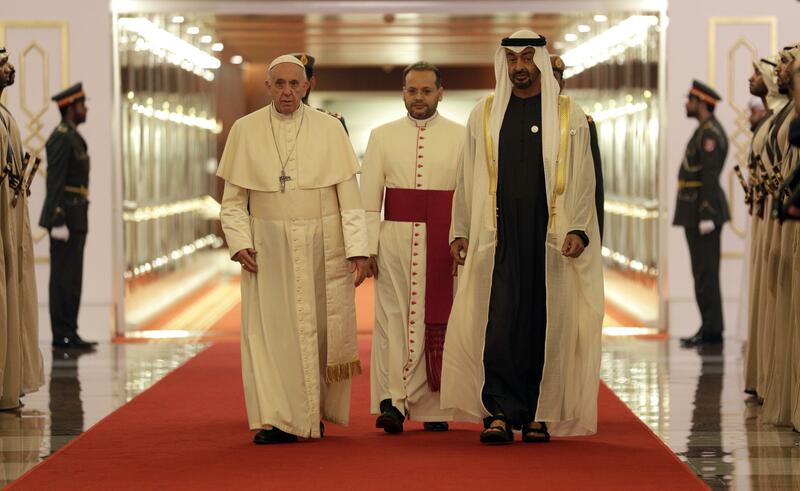 Abu Dhabi’s powerful crown prince, Sheikh Mohammed bin Zayed Al Nahyan, greeted the pontiff with smiles along with Cabinet ministers and an honor guard when he landed around 9:50 p.m. in the Emirati capital. Published: Feb. 3, 2019, 3:03 p.m.